Samples less than 100 ml in size can be difficult to distill into high quality fractions. Most distillation equipment is either too large for small sample sizes or is not efficient enough. The B/R 800 Micro-Distillation apparatus has up to 30 theoretical plates and can distill samples smaller than 5 ml. High quality fractions can be distilled from expensive or "hard to get" materials. High Efficiency: Micro spinning band distillation technology has up to 30 theoretical plates, generating fractions with excellent separation even on very small samples. Micro spinning band distillation is well suited for producing high purity materials and making difficult separations. Low Column Hold Up: B/R 800 micro-distillation apparatus has a low column hold up. After the distillation is complete, less than 0.1 milliliters will be left behind in the distillation column. Low column hold up is always desirable. But it is especially important when the sample is very small to begin with. 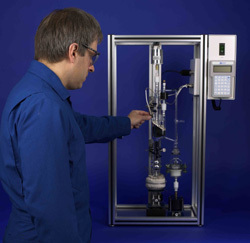 Low hold up ensures that valuable sample is not lost in the distillation column. It also makes cleaning the equipment between distillations easy.